NASA’s Dawn mission, currently in the midst of studying Ceres, released new findings on some of the curious features discovered on the dwarf planet after the craft’s arrival back in March, becoming the first spacecraft to orbit two celestial bodies in the solar system. 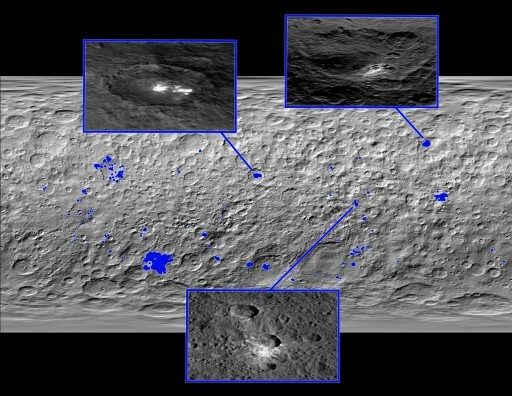 Taking a closer look at Ceres with camera, spectrometer and gamma-ray and neutron detector, Dawn found Ceres to be a world with many well-kept secrets instead of the piece of uninteresting rock it was thought to be. 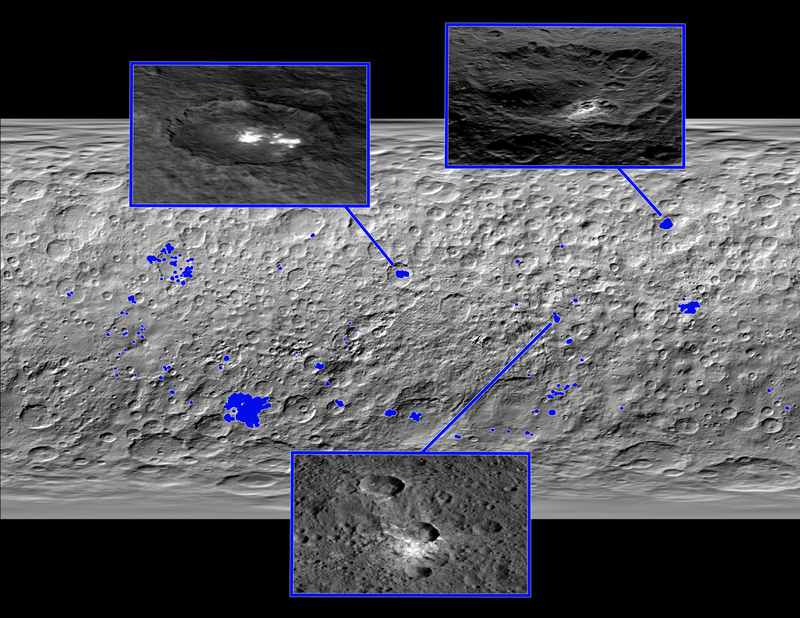 In recently published studies some of Ceres peculiarities are highlighted including the prominent bright spots that had caused much discussion even before Dawn arrived, and hazes appearing during daytime heating, not found elsewhere in the asteroid belt. Earlier, scientists presented evidence of energetic electron bursts coming from Ceres that are not yet fully understood but may arise from interaction between the dwarf planet and radiation from the sun. The characteristic bright spot within Occator crater had been detected by Dawn’s Framing Camera when the spacecraft was still thousands of Kilometers out and led to a vivid debate centered around its possible composition and origin as the feature that stood out in the early approach phase of the mission. However, as Dawn got closer and eventually entered orbit, it became clear that Ceres had many bright features – more than 130 to be exact. This large number of bright areas led to speculation of them being ice deposits or evidence of active cryovolcanism. Because most of the bright areas are associated with impact craters it would seem that the bright material is abundant within the sub-surface of the Dwarf Planet. 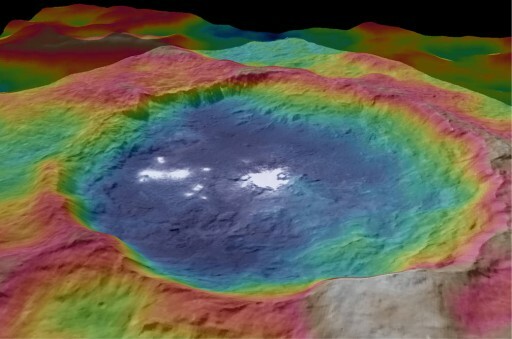 A study conducted at the Max Planck Institute for Solar System Research in Germany concludes – based on spectral data showing the bright areas reflect light primarily in the blue wavelengths – that the bright material is consistent with hexahydrite, a type of magnesium sulfate, that accumulated in these salt-rich areas when water ice sublimated into space after asteroid impacts unearthed the salt-ice mixture. 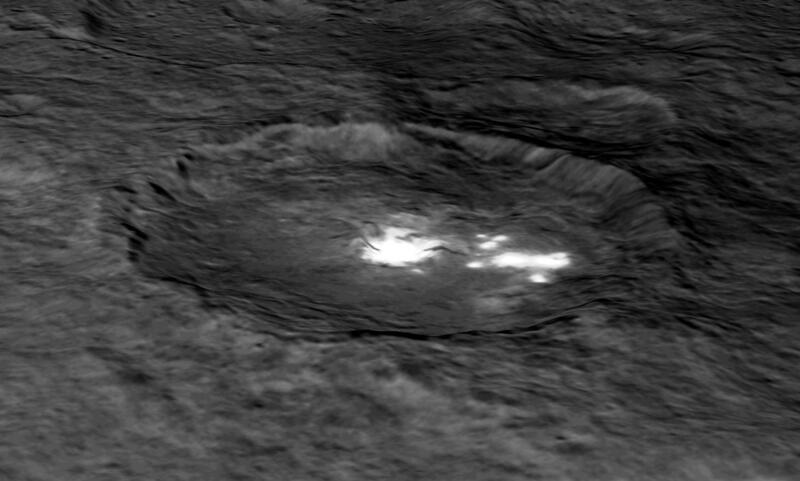 The study concludes that the most plausible explanation for the abundant bright features is a large-scale ice-salt mixture under at least parts of Ceres’ surface. The presence of water on Ceres does not come as a surprise as ESA’s Herschel space telescope had already detected signatures of water vapor being released from Ceres. Scientists suspect that Dawn is observing the end of a more active period characterized by evaporation processes occurring at different magnitudes in different locations. Dawn also took a closer look at Occator, the large crater with the most prominent of the bright spots which, as it turns out, is not the only outstanding feature of the 90-Kilometer crater – it is also believed to be the youngest on the surface of Ceres. Its central pit, covered with bright material, is about 10 km in diameter and 0.5 km deep, highlighted by dark streaks traversing the pit, likely representing fractures of the surface. Also seen in the crater are remnants of a central peak that may have been up to 500 meters in elevation. Scientists put the crater’s age at 78 million years due to its sharp edges and smooth floor not yet disturbed by recent impacts. A number of views of Occator have shown a tantalizing layer of haze filling the floor of the crater. Possibly, this haze is what Herschel detected back in 2014 as water vapor, but due to its large distance to Ceres it could not resolve the source of the signature. With Dawn getting an up-close look, imagery returned by the spacecraft shows that the haze layer is tied to the peak heating portion experienced at noon, local time. It appears that the haze is caused by a phenomenon known from comets as water vapor is created through heating and lifts small dust particles and residual ice creating an optically opaque haze. 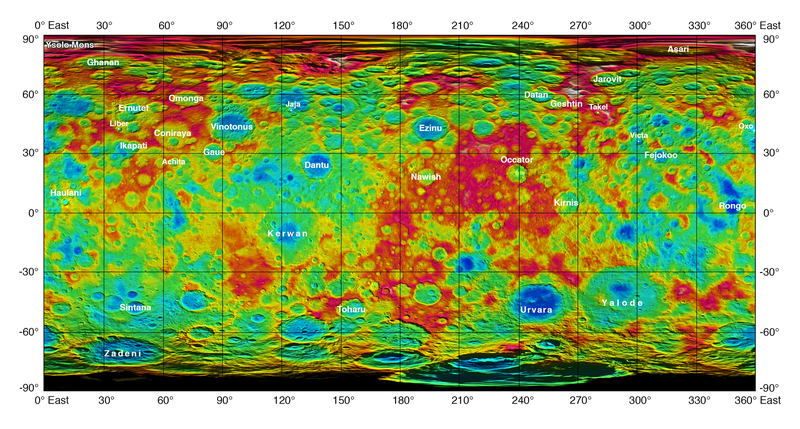 The second study published in the journal Nature focused on the composition of Ceres and is highlighted by the discovery of ammonia-rich clays that were identified through data from the visible and infrared mapping spectrometer. Pure ammonia ice would evaporate on the surface of Ceres because it is too warm, though still extremely cold by Earth standards with an average temperature around 200 Kelvin (-73°C). The presence of compounds containing ammonia is of great interest because it suggests that Ceres did not form in the main asteroid belt between Mars and Jupiter, but instead traveled from the outer solar system or was subjected to materials that came from these outer regions where ammonia and nitrogen ices are abundant and stable. The signatures of ammoniated minerals in spectral data returned by Dawn was a surprise as the expectation was to find similar spectra to carbon-rich meteorites that were long believed to be of similar composition as Ceres-type asteroids. 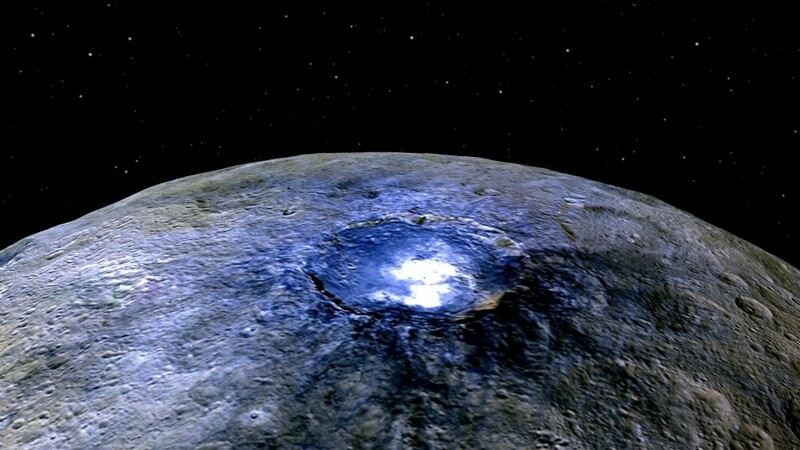 Also, quantitative analysis revealed that Ceres has a higher water content than the meteorites, indicating that Ceres either collected water from volatile-rich materials or retained it from a past evolutionary stage. Since its arrival in March, Dawn has been spiraling down towards a low orbit around Ceres that it reached this week, flying just 385 Kilometers above the surface. 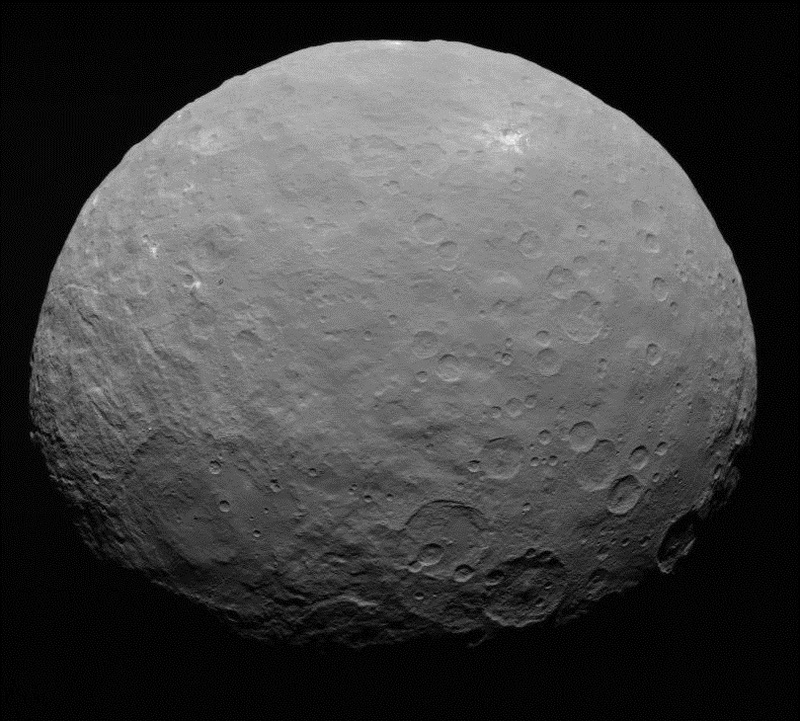 In this final science orbit, Dawn will be able to capture images at a ground resolution of 35 meters as well as high resolution infrared, gamma-ray and neutron spectra plus well-resolved gravity maps that may provide hints at Ceres’ internal structure. The mission is currently expected to conclude in the first half of 2016 after a decade-long journey of discovery that started with Dawn’s launch in 2007 sending the craft to asteroid Vesta, studied by Dawn in 2011 and 2012 before leaving for Ceres.